Despite the cold spell, it really is that time of year when residents throw caution and time to the wind and decide to host a yard sale themselves. The rise of yard sale popularity comes at the same time as the rise of a trend called “Swedish Death Cleaning.” Many articles and books can be found on this subject, but essentially the idea is to keep only those things in your house that give you pleasure to look at or that you need to have for the house to function. Don’t save boxes and boxes of stuff for your offspring to have to sift through — and most likely dump — after you’re dead. Do it for them now while you’re alive. This idea of Swedish Death Cleaning also comes around to clothing and shoes. If you haven’t worn the item in over a year, you never will. Get rid of it. The hardest things for people to throw away, according to Swedish Death cleaners, are items either inherited or belonging to someone who has died. We develop sentimental attachments to things we don’t aesthetically like. It’s time for those things to go as well. So how do we balance the excitement of acquiring new-to-you things cheaply without having to have a future yard sale yourself because you have too many things? 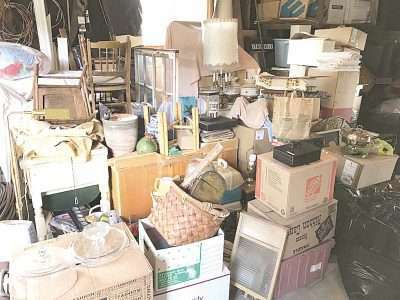 Experts say it’s best to hit the yard sales with a both a budget and a list of things you’re looking for so you don’t stray off budget and you don’t come home needing your own yard sale to make up for it. There’s also the wild card of finding a one-of-a-kind item. If you feel it in your gut, make the purchase. Other tips of the trade. Be prepared for a long day. Bring plenty of water and healthy snacks for yourself. Bring old newspaper and a couple of boxes in case sellers run out or don’t have any. Keep your car or truck packed with rope in case you need to tie something to the roof. “Always stop at kids’ lemonade stands,” says Crescent Country owner Lisa Forcino. Make sure to have plenty of quarters for those small purchases. While it’s true the early bird gets the worm (and some of the best items out there), the bird comes at break-down time that gets the deal on the big items. No one wants to move a giant piece of furniture back in the house because it didn’t sell. Most sellers are already visualizing that hutch from the 1970s out of their lives forever. They don’t want to bring it back in. Offer them 20 bucks and it’s yours. Set your goals and price points. Moving? Price everything in the must-go price range. Some yard salers set a goal for a weekend — $500 for example. Is the goal to clean out the garage? Then set the goal at $100 and clean. While there are no hard and fast rules, there are quite a few suggestions by local yard sale shoppers Lisa Forcino and Cookie Jackson to make it a terrific sale for you. Large, well-placed visible signage is a must. It’s frustrating for yard sale shoppers to miss your sale because of only one sign up a dirt road. Stage the yard sale. Just like showing a house, if more people can see what the item is and how it could look in a setting, they’re more likely to buy it. Customers like engagement. Don’t just sit back in a lawn chair snacking and drinking beer while attempting to sell items. Have appropriate change and cash available that reflects what you are selling and how much you are selling it for. Hang your clothes. Don’t just lay them on a tarp or wad them in boxes. Yard sale shoppers don’t want to hunt through a box that should just be thrown out. Know your merchandise and price accordingly. Just because a book is old doesn’t mean it’s worth anything. In pricing books, the smaller the print run, the more rare the book is and the more valuable. If you saw it at Costco, it’s not worth anything. After the yard sale, be courteous to neighbors and nature and take down all signs. It also makes it less taxing on drivers who think there’s a new yard sale when it has really passed. Thanks. Got some good tips. Priceing is where I have trouble. Any suggestions? Thanks. Got some good tips. My problem is pricing. Any suggestions?